Awhile back I was reading through a back issue of Nuts & Volts magazine and came across an ad for the LeakSeeker 89 from Electronic Design Specialists. I was intrigued by the device and searched for a place to buy one, even a used one, but they were nowhere to be found. This led me to contact Dave Miga and order a parts kit. The kit price was reasonable for not having to source parts and deal with minimum order quantities plus he is the only source for the programmed PIC microcontroller. 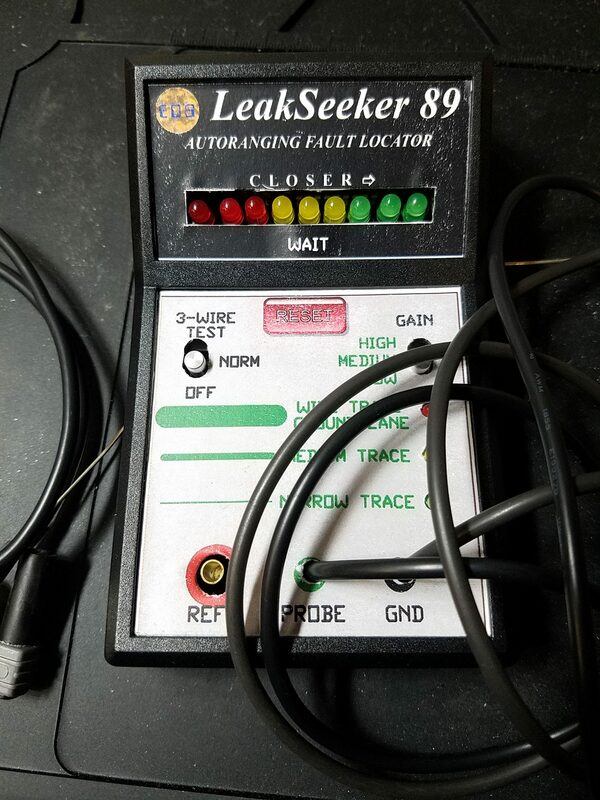 The LeakSeeker 89 locates the exact spot on the PC board (to within a fraction of an inch) where a shorted or leaky component is bringing a power supply bus or data line to ground. It is the only locator that can locate defects from zero to 300 ohms with no loss of resolution. It can even find active shorts that a DVM won’t even show. 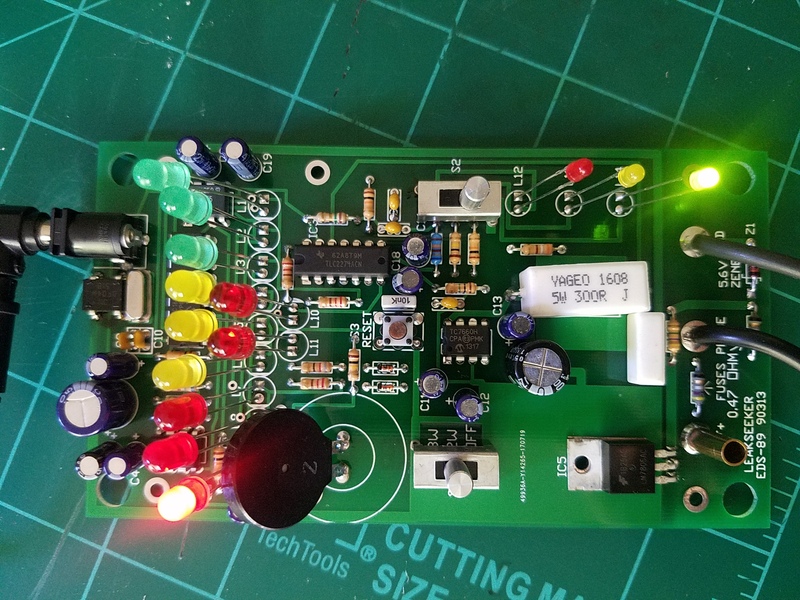 The high GAIN mode can locate shorted components on multi-layer boards with ground planes and a power layer. After ordering the parts, Dave emailed me the bill of materials, enclosure overlays, Gerber files to get the PCBs manufactured. Not wanting to pay the suggested $100 for 5 PCBs, I invested some effort into converting the Gerbers into standard format and getting them ready for manufacturing at a place like EasyEDA or OSH Park. EasyEDA was the cheapest and OSH Park, though high quality and quick, was expensive. So, having the parts and PCBs arrive, I began construction. Keep in mind, there are no assembly instructions at this time. (I’ll update here if I develop some.) It took me about two hours to get a finished product minus the enclosure (I’m waiting for it to arrive). Assembly is pretty straightforward with typical through-hole components. The only issue I had was installing the BR2 rectifier backwards since it is not obviously marked (the square pad is the + pin). I haven’t had an opportunity to use the LeakSeeker yet, but, after some basic tests, it appears to function. The next steps are to get the case, drill it for the LEDS, switches, and probes, then make and apply the overlays. Dave provides all of the dimensions needed to ensure a quality completed product. PCB: These are for sale through a few outlets. The best price will be at the Eccentric Workshop store, but they are on Tindie and eBay. Enclosures: OKW Tenclos Pulpit 590.9 – these are imported from Italy and you must email the company to order (I worked with Jeff Duchess). If there is enough demand, I may stock these.